The #CEOSleepOut2016 has been described as a “major success” with million of rands raised for educational causes and hundreds of homeless people getting assistance. Chief Ambassador of the Sun International #CEOSleepOut2016, Yusuf Abramjee, said almost 1000 people gathered on the Nelson Mandela Bridge in Johannesburg on Thursday evening. 200 of them were CEO’s. They were joined by students. “Pledges are in excess of R25million. Gift of the Givers and Operation Snowball distributed clothing and blankets to hundreds of homeless people yesterday – thanks to the Sun International #CEOSleepOut2016,” Abramjee said. “There has been some criticism about the event on social media. People are entitled to their opinions but the reality is that the Sun International #CEOSleepOut2016 is making a real difference,” he added. Gauteng Premier, David Makhura, and Johannesburg Mayor, Parks Tau, who also took part in the Sleepout said the criticism was unfounded. “We will continue to support and grow the CEO SleepOut and the business sector is assisting to help those in need. We will continue working with them,” Makhura said. Last year, he also joined CEO’s for the night. Sexwale made a surprise visit to the #CEOSleepout2016 to pledge his support and offered to host the event on Robben Island in 2017 on Mandela Day, 18 July. Finance Minister, Pravin Gordhan, called on the CEO’s to continue making a difference and said municipalities should all also support the event in 2017. Over 60 schools, 10 universities and colleges and 40 companies took part in School, Student and Sympathy Sleepouts this year. Last night, hundreds of people gathered in Laudium, Pretoria, for a Sleepout to raise awareness and assist charities. Ali Gregg, CEO of the Sun International CEO SleepOut said plans were underway to grow the event and also take it to other parts of the continent. 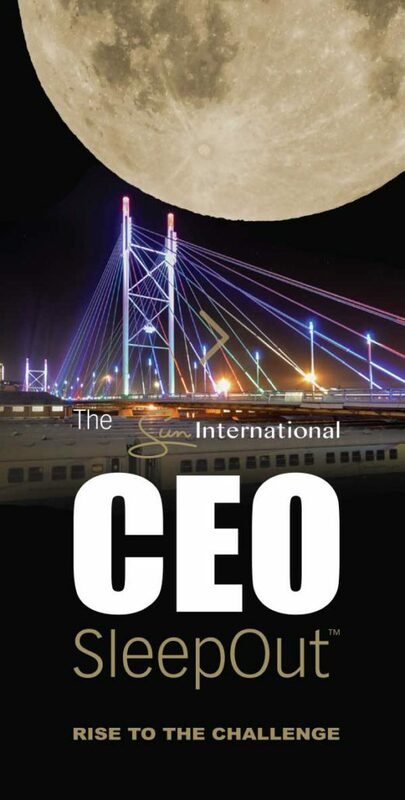 Other Sun International #CEOSleepOut2016 ambassadors are Carolyn Steyn from 67 Blankets, media personalities Leanne Manas and Ashraf Garda, Singer Yvonne Chaka Chaka, Editor of the Star, Kevin Ritchie, Australia’s High Commissioner to South Africa Adam McCarthy. 11 school and student leaders are ambassadors. Next week, Brand SA’s a “Play Your Part” movement will distribute hundreds of books to schools. They were collected on the bridge. Sun International has announced they will again sponsor the CEO Sleepout next year.